List of known bugs for HTML5 port down below. Misfortunated guy walks upon bottomless pit and falls down to the Underworld. There he meets evil spirit, who is going keep to you there forever. Expel the evil spirit before He casts curse upon you and escape the Underworld! Time is ticking, do you feel the pressure? Make pillar, be below it, draw on yourself to get top of the pillar. Windows -downloadable version does not have these bugs. Pretty cool mechanic! Although I should have been more careful with the meter. Hey, thanks for playing my game :) Yeah, limiting erasing power wasn't good idea... Btw, I used surfaces and collision is made with "Surface get Color"
There is cheat code for more points, hold backspace and repeatly press numpad+ for more points, 36 points and portal appears when touch the skull. The "drawing the platforms" mechanic is a fun one, and this was a nice use for it. It took me a long time, and a lot of failure, before I realised I could erase platforms as well lol. I wish I didn't have to figure that out on my own. Hi, thanks for the feedback :) I'll go check your game in a moment. Yeah, sorry about lack of istructions, I thought it would break immersion if I had to explicitly tell player ingame how to play. Secondly I just didn't have time to put any ^^" So "the guide" is here in gamejam-page. This is a really interesting and fun game. Drawing a path for yourself is a neat mechanic and I like how it both helps and harms you as the path you've already made ends up becoming an obstacle after a while. 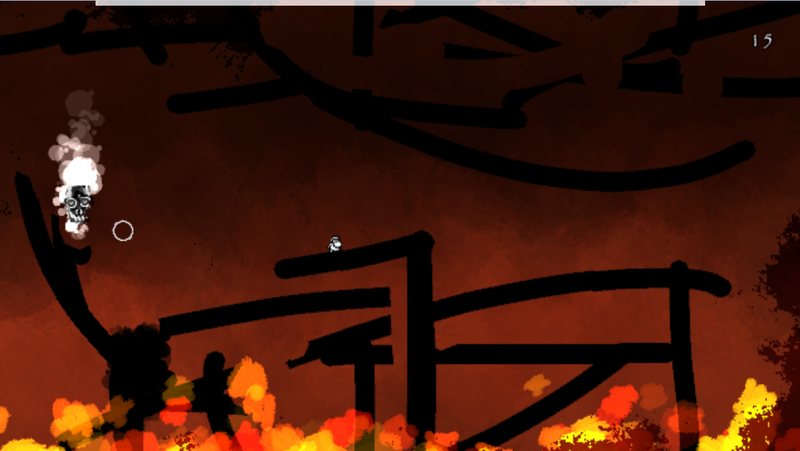 Chasing down the demon thing puts the drawing mechanic to good use and is quite challenging. The best I got was 28. The presentation is also top notch. Just the fact that you have an intro cutscene is cool on it's own. The graphics all look great and work together well. The audio is also very effective. I particularly like the demon's voice and how the music gets more hectic as the times goes down. Overall this is just a really well made game! I did not find mere timer on the corner appealing, and I wanted player to feel the pressure of time running out. Visual and audio clues worked, but as afterthoght I would have made different runes appearing around the player representating the curse before it is finally casted. This is really neat and well done. Great job! The game is really visually and mechanically impressive! The Audio is good and it has a lot of nice touches, speeding up and the tick tock like effects. The gameplay is great but sometimes feels just a little unfair when you get stuck on something really small (my fault for making a mess I guess lol) or the skull appears at the extreme bottom of the screen. The black smog spawn points are needed but it feels a bit bad to lose a game when it appears in front of you and blocks you. I did end up winning after 4-5 tries though! it wasn't easy. Honestly though, this game is really really well done. from the cut scenes, amazing art style and the unique gameplay. It was rather funny too. Well done, and thanks for the feedback :) Had fun making the audio, I got no musical talent, but samething basic beat which gives feeling that time is running. 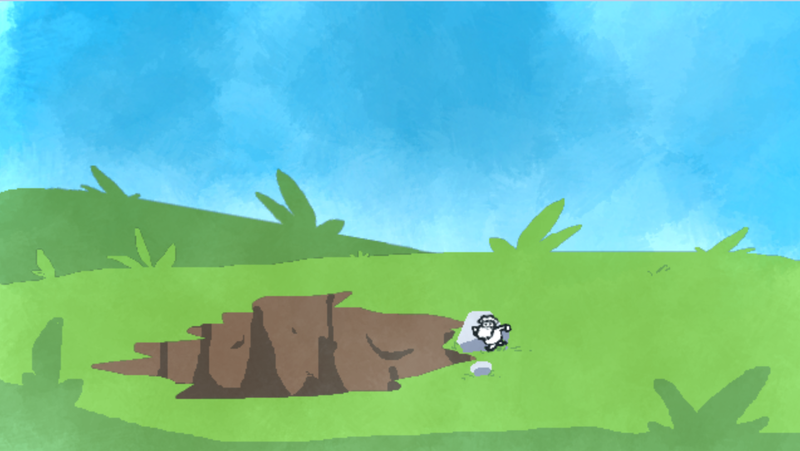 First problem was something, which is not easy to fix, as the player itself accidently draws hooks where can get stuck. Something which rounds up small details could have worked, I dunno how to make it. Secondly, I thought I fixed skull getting too high or low, well maybe forgot to do that "\/( ' - ' )\/"
Thirdly, black smog spawns, I thought they were bad too and I was going to fix them if I had spare time. Initially they were even worse, spawning immediatly below player when he caught skull (it disorientated player). Now the platform appears at same time when skull reappears, just below skull's previous position. Better solution would have been platform appearing only when player falls and disappears after player has stood on drawing for awhile. I enjoyed this! The concept was simple, and fun to me! I also really appreciated the intro sequence! It lends a good feel to the game, and really takes it to a level of polish not usually achieved by game jam games, I feel. The art was simple, yet effective and the sound was very good. I very much liked playing this game, and had fun with it, even though I am not very good and didn't beat it! Keep up the good work! Thanks for the feedback :) I'll try your game soon. I caught him 22 times and did not escape from the underworld! Hey, thanks for playing the game :) I'll try your game soon. 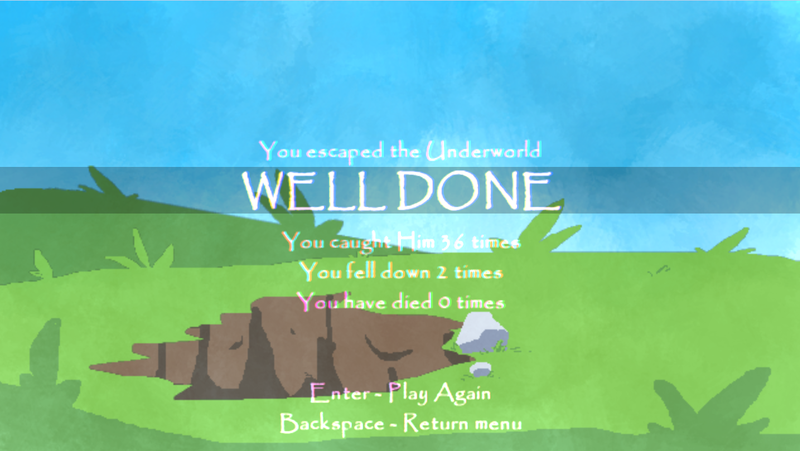 If you want to escape the Underworld, you can also cheat with Backspace and Numpad+ ;) There is short outro. I loved the game so much. I like the fact that it's very polished and everything has an intro and outro animation. The sound of the scull i perfect. And the gameplay, ohhh, the gameplay! Thanks for playing the game and it is nice to hear you liked it :) Not sure if you beat it, but if you want to see ending outro, Backspace and Numpad+ for more points ^^ I had some problems first with collision not being forgiving enough, until I decided to make player collision just being a point. Therefore, if there is even a small gap, you can go from there. YOOOOOO this is so good!! I still love the presentation of your games, there's even a intro cinematic! But the game itself is really good. I couldn't get past 30 (I'll try again another time), but I love how you designed it. At first I thought it would be one level at a time, more like a puzzle, but the fact that your previous drawings can get in your way is really fun. You have pretty much full control of everything, but it can still be challenging without being impossible, so good job on that too. You can cheat with Backspace and Numpad+ ;) There is short outro also. From game design philosophy point I wanted to player have almost full control, and the challenges are basically created by player. Different playstyle creates different challenges, planning might help, you have 30 seconds in the beginning, shortening to 5 seconds eventually. Drawings falling speed starts increasing somewhere from 20 points, until 40 points hitting max speed. The only complaint I could offer is that there was little indication where the paths I made were expiring. Other than that...innovating! I couldn't find a way myself to make a game that allows players to make their own path in platforms without making some very complicated collision code. This was a very interesting take on the countdown theme. Hey thanks for the feedback, HTML5 version is not currently working, noticed same bug. In Windows vesrion the paths will not expire, but they start to fall slowly. Edit. Aw nuts, you cannot upload newer version. Anyways, moving drawings code does not work in HTML5, and because slow framerate issues I would have downgraded graphics and sound. pretty good. I like the evil laugh when skullman appears, the music speeding up when time's almost up, the fact that the footsteps are clockticks, the drawing mechanic is cool. not really anything to complain about. About the development, first I thought you wouldn't try touch evil spirit, but you would try get to door, which would bring you next room. Next room would have previous drawings but as red hot and you shouldn't touch them. Current way worked better, gets pretty hectic towards end. After counter ran 0:00:00 the GM48 mobile page said "the 26th theme: Helpful but Harmful"
So yeeeah, I started making my game with old theme on mind, because I didn't know it was old and somehow the mobile page showed old theme there. Also didn't notice it said 26th not 27th. After I got to "know" the theme I went to sleep, next day I played Pokemon Go with friends (Zapdos day). At the evening I come up with idea of drawing the platforms, and going level to level by reaching exit door, and on next level the previous levels drawings would be there, but as blazing hot which you cannot touch. Didn't like it that much, as it didn't feel as good (thought you could go back to previous room and redo the level). After basic game design and mechanic had been made, I went to sleep to get better idea next day. After some brainstorming I came up with current idea, you are gonna get cursed, gotta go distub the evil spirit before it casts it. So gameplay had time, which was running out. Remember, I still didn't know right theme, I had only checked GM48 page with mobile couple of times. After I have basically finished the game and some hours left to make intro and outro scenes, I went to see GM48 page with PC and saw to my horror that theme wasn't right. I was sure I had looked it couple of times, so I went to watch with mobile phone and it still showed old theme (I took screenshot). I was lucky, that game had now "countdown" contrast to starting idea. I wouldn't have time to add any other theme etc., as I think I got less than 3 hours left.